(CNN) -- Preakness Stakes favorite Rachel Alexandra lived up to her billing Saturday, thundering past an all-male field of competitors and becoming the first filly to win the Triple-Crown's second jewel since 1924. 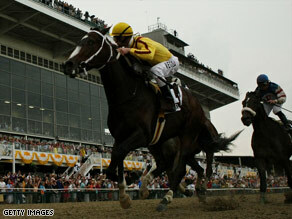 Saturday's victory for Rachel Alexandra, who raced from the 13th and furthest stall, was the filly's fifth straight win. "She's the greatest horse I've ever been on in my life," jockey Calvin Borel said after the race. "She did not handle the track 110 percent and still won." Long-shot Kentucky Derby winner Mine That Bird fell short in his improbable bid to compete for horse-racing's Triple Crown, but showed his Derby victory was no fluke -- charging hard to finish second. Rachel Alexandra's win was historic for multiple reasons and capped a run of five straight victories that included a blowout of the field in the all-filly Kentucky Oaks. She became the first horse to win from the race's 13th stall -- the furthest from the inside of the track. She ran at the front of the mile-and-one-sixteenth race for almost the entire time. Mike Smith, Mine That Bird's jockey on Saturday, said Borel gave him advice on how to run the undersized champion on Saturday. The two chatted after a finish in which less than a single horse-length separated the two. "I said if I'd had that rail trip, it might have been a different outcome," said Smith, who'd hoped to take Mine That Bird to the inside of the track just as Borel did in the May 2 Derby. "They knew I was going to do it so everybody was just sticking on it."